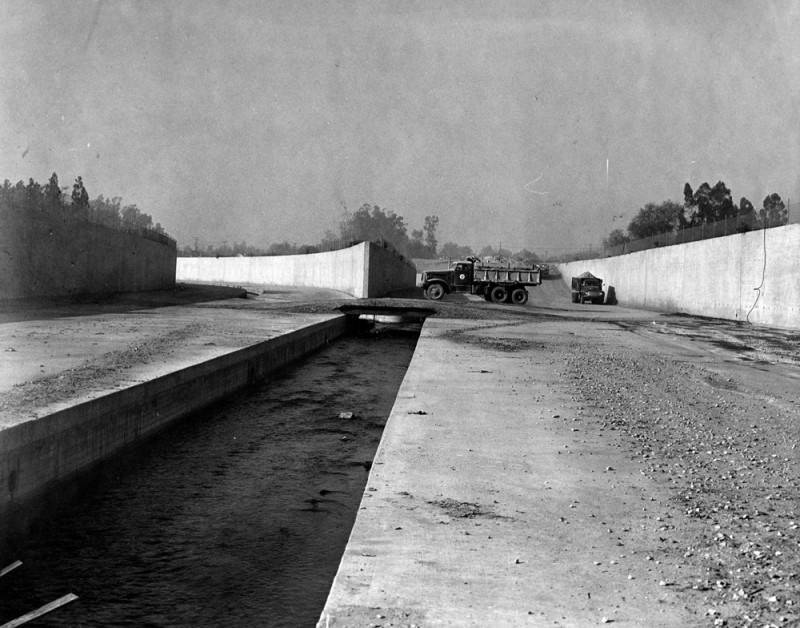 After the disastrous 1938 floods, the City of Los Angeles worked with the State of California and the Federal Government, specifically The Army Corps of Engineers, to encase the rivers of Los Angeles in a waterproof lined concrete sewer to expel waters during the rainy season. 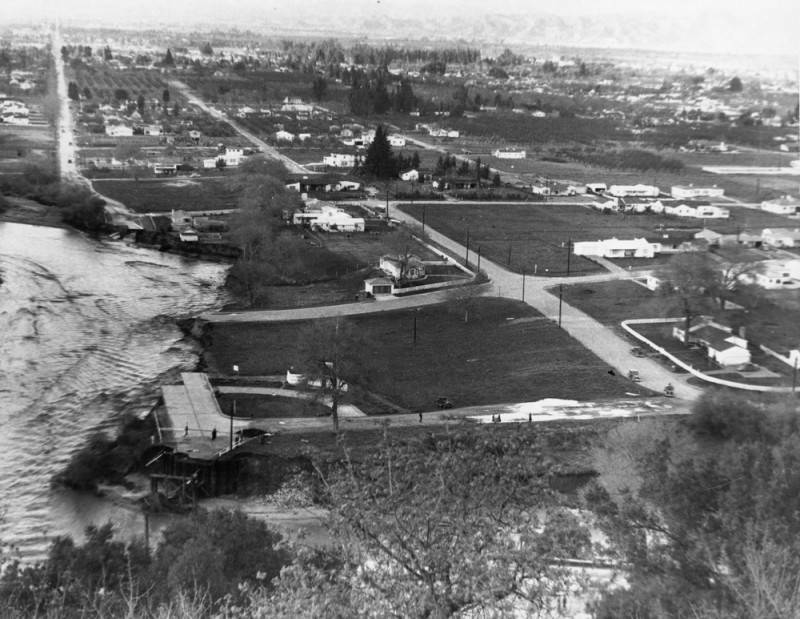 These December 1949 photographs, archived at the LAPL in the “Valley Times Collection”, show the splendid progress of turning natural riverbeds into something distinctively man-made without natural life. 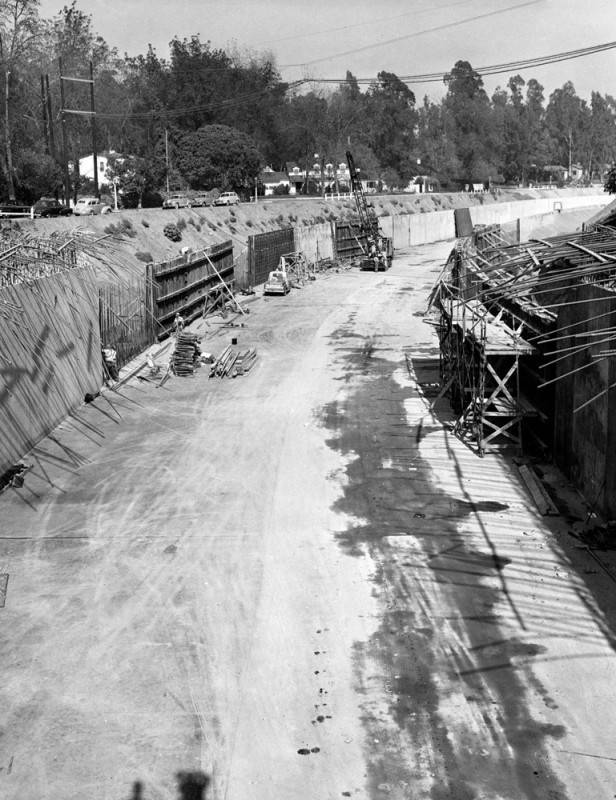 The cost, at the time, was $72 million, which is perhaps $800 million today, but sounds like a bargain, since the Getty Center mountaintop gouge and railroad itself cost $1.3 billion dollars upon completion in 1997 and the widening of the 405 five years ago was a $1.6 billion dollar project that has since added one lane in each direction and shaved 10 seconds off each commuter’s journey. And let us ponder that our latest crisis, homelessness, will be remedied by taxpayer dollars close to $5 billion. Not the Federal Government, not the State of CA, but taxpayers, you and me will shell out to well-meaning bureaucrats and post-collegiate interns, $4.6 billion to build housing — 10,000 units in 10 years — and “provide supportive services” for homeless people. When every person in need on every continent around the world, every down and out person from every state, city and town in the US, Canada and Mexico, arrives in Los Angeles, we will see how well this plan goes down. It once was against the law to dump garbage in parks, to set up tent cities on sidewalks, to sleep on benches, under bridges, but now this is a behavior eliciting “compassion” because that’s how you are directed and asked to speak of it. You must not condemn what your own eyes tell you is wrong. Let it grow, let it expand, then create new programs to fight it, until it becomes unstoppable. 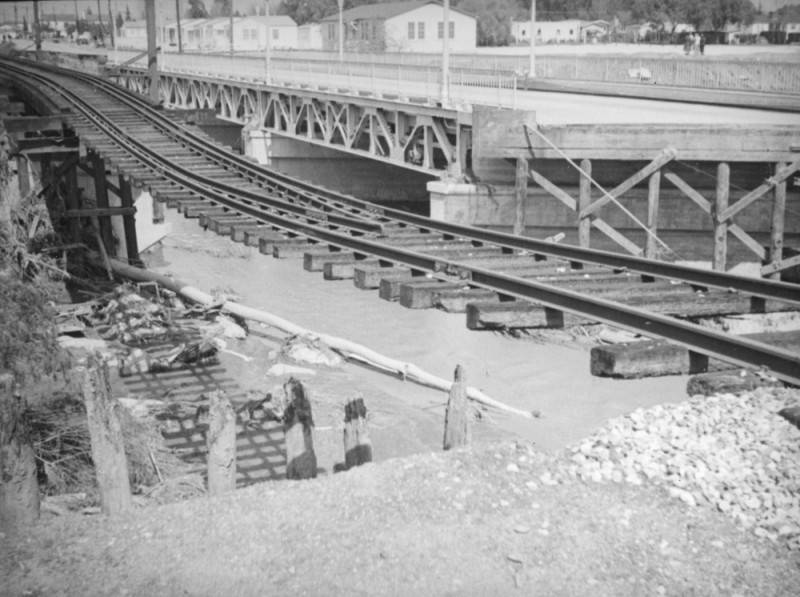 A city that once built hundreds of miles concrete rivers to stop flooding, cannot erect temporary shelters and police the filth and disorder and rampant grossness of the ever growing homeless situation. 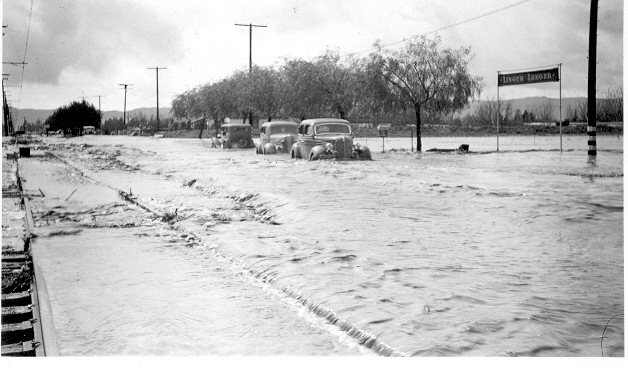 1949 was a different time, for Angelenos were not intimidated and cowered into attacking threats that endangered the growth, health and well-being of this city. Laurel Canyon Bl. near Ventura. 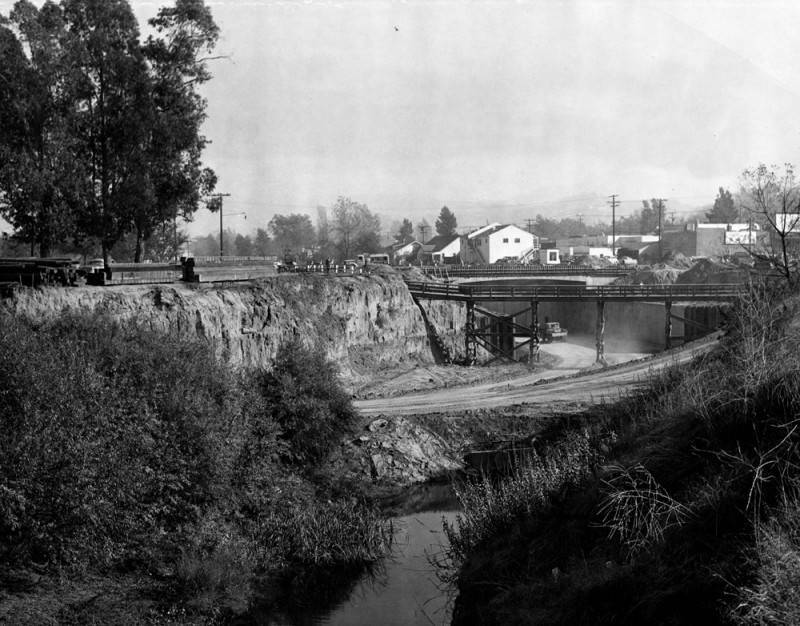 The concreting of the LA River in the San Fernando Valley allowed the development of housing right up to the edge of the old slopes. No longer would houses and apartments face potential destruction from heavy rains and overflowing waters. 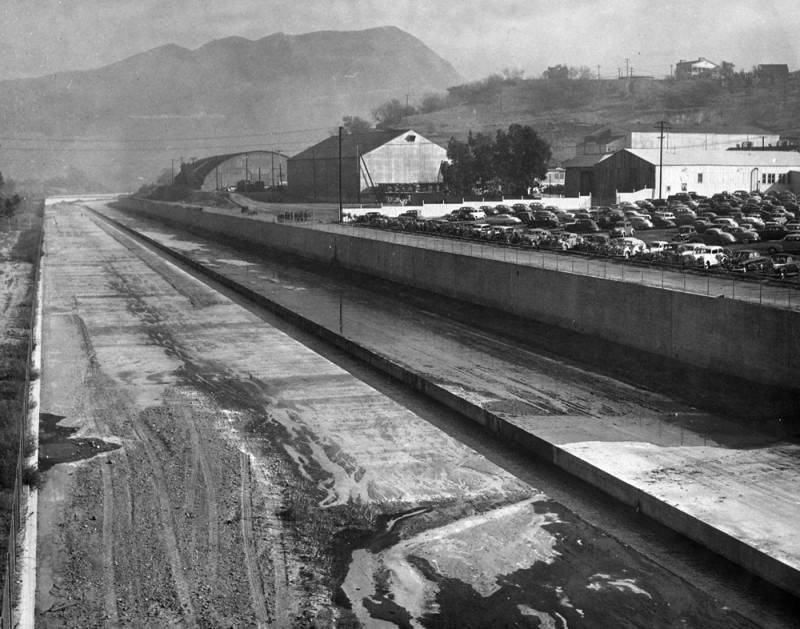 Soon the freeways would come through, another onslaught of concrete that helped transform the San Fernando Valley from a place of horses and orange groves to one of parking lots and 10-lane local boulevards. 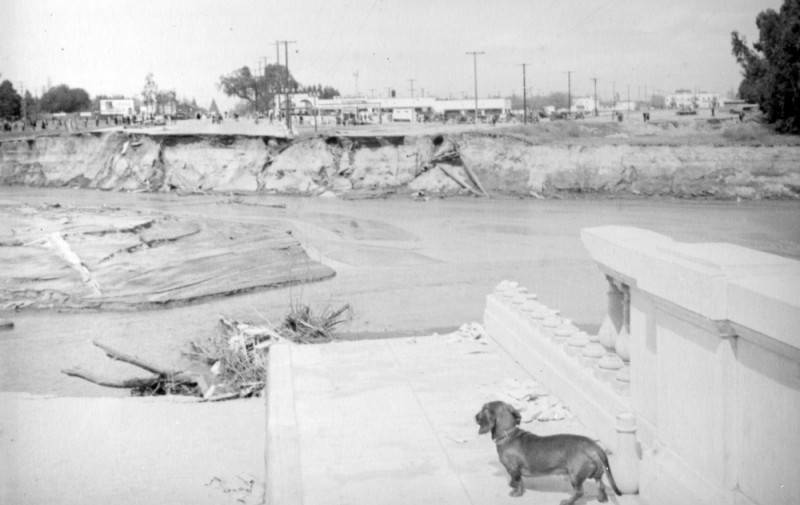 Today, in many parts of the LA River, most notably in Frogtown and along some sections of Studio City, there are naturalizing effects going on, and residents are biking, hiking, and even boating where it is permitted in the once fetid waters of the river. It was a bargain for real estate owners: it probably doubled or quadrupled the price of their land, for a massive instant tax-free work-free profit, entirely paid for by the government. It still is — even giving food to the homeless for charity is illegal in many places. Over a century ago a french writer pointed out that “In its majestic equality, the law forbids rich and poor alike to sleep under bridges, beg in the streets and steal loaves of bread.“. * The “favelas” do bring down the price of neighbouring areas, but the local government knows that only the price of property in elite gated communities matters, and those are kept well free of interlopers by private security, and those who live in elite areas don’t want to pay higher taxes to fund more police elsewhere to push the “favela” people out of lower income areas. * The sight of extensive “favelas” in the USA has a “salutary” effect of reminding the lower classes that becoming underclass is an always a possibility and they should always be docile and do everything their boss says, or else. The USA elites have chosen the brazilian social model (which is a variant of the dixie model). ← Looking East For Ideas.